It has been quite some time since I have had the opportunity to review a new-to-me apparel brand, but today I get to and I am pretty excited about it. I learned of AUR about a year ago and heard some very positive things, but up until recently I hadn’t had a chance to try them or see them up close. Now I realize what I have been missing out on! After receiving a few pieces from the 2013 AUR collection my initial thoughts were that I loved the tops and liked the bottoms. The tops had unique designs and cuts, while the bottoms were nice, but nothing out of the ordinary – just your regular golf skort. The fabrics on the skorts were different, and those I absolutely loved, but the actual style was nothing new. However, I found them incredible flattering and comfortable. I loved how many of the AUR tops have unique necklines, which I thought really made the pieces stand out. One polo shirt had a great design on the neck that was seen again in the sleeves, taking what could have been a simple shirt and turning it into something that I will wear on and off the course. This is really the only place where I have any complaints about the apparel, and it has more to do with my body type than the clothing. I found one of the polos to be too snug in the arms. In fact, I struggled to get my arms through the holes. If you have ever seen the movie “Tommy Boy”, try to picture ‘fat guy in a little coat’ but more like ‘large armed girl in a little shirt’ and you will know what I mean. In short, my arms got stuck and I needed assistance getting them out of the shirt. The other polo I tried on was beyond comfortable. It fit my growing arms and felt great against my skin. This is the type of shirt I would wear with a pair of jeans for a fun night out, but it’s a golf polo, so I can be stylish and comfortable on the course now too. It had a deep V neckline, which is my absolute favorite. There is nothing worse to me than feeling like I am suffocating because of a tight neckline. It’s hard to say if they run true to size, because of the major difference in the fit of the two tops. One definitely did and the other might have, but I couldn’t get it all the way on to tell. Again, this is more of an issue that is personal to me, but something worth noting if you are similar and have slightly larger arms. The bottoms fit perfectly – everything about them fit like a glove. The length was just how I like it, falling to just above my knees, and the waistline was spot on. One of my biggest pet peeves about skorts is how they ride up when I walk. I didn’t see that at all with the AUR skorts, so that was a huge bonus. I can’t speak for the shorts or pants, but the skorts fit very true to size. Overall, I was very pleased with this brand and I cannot wait to try more from them. The fabrics felt so good and allowed for incredible movement, making it very easy to swing a golf club. The cut and fit on the bottoms was perfect, and with a little time at the gym, I think all the tops will fit great as well. I really enjoyed the variety of styles and colors that AUR offers and I love that they use eco-friendly material. The press release below will explain more about that, along with additional information on their new 2013 line. You can also visit their website at www.aurgolf.com. You can find this line at great online retailers such as www.Golf4Her.com. “A|U|R”, a young quality golf apparel collection, with great success in the U.S. and Canada, and is being introduced in Europe for Spring 2013. AUR has a modern fit for the golfer/athlete who wants performance clothing with a distinct look. For Spring 2013, AUR will now include the Stormpack outerwear line. AUR stands for ‘All that you Are’. The philosophy for this authentic golf brand is and will continue to be the goal of providing the most value-added, aspiring golf fashion on the market. The Spring 2013 color palette for men features basic must-haves in a myriad of colors that all merchandise back to the men’s fashion collections. An assortment of cool grays and black mixed with additional bright blasts of color: Pool, Crimson and Slate are the highlight colors for Men. For women, distinctive style, fine quality and an aura of sophistication lends itself nicely to a golf collection that is current and on-the-ball. Fashion driven Sweet Praline features a stylish Geo print paired with classic plaid bottoms. Pretty in Pink features Passion Pink with subtle grey accents to provide a sporty, fun look. Purple Haze is all about bright trendy colors. Wisteria and Emerald green are base for this group with a cool diamond inspired print. spandex, a soft supple hand feel and a lightweight drape that makes it ideal for swinging a golf club. 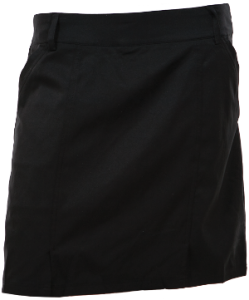 Golfers will appreciate the long lasting synthetic fibers, which create a strong, crease resistant fabric that is quick drying and maintains its shape season after season. 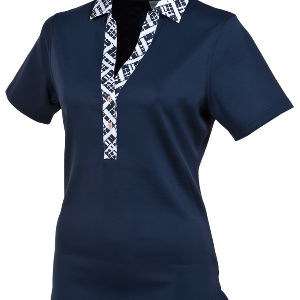 For example, the AUR Tonal Embossed polo is available in bright colors such as pool, slate, crimson, black and white offering the golfer comfort, breathability and a stand out look on any fairway, especially combined with the Active plaid flat front pant in navy plaid, coal or pool plaid. Next on the tee is AUR Authentic, a collection of more traditional golf-inspired clothing. An assortment of sweaters, vests, pants and shorts round out the category in classic colors of black, navy, taupe and charcoal. Classic inspired v-neck argyle vests and full-zip cardigans in black or indigo are standouts in this collection. These argyle classics have a front panel design with ribbed finished collars, cuffs and waistbands. Finally, AUR Aware is continuously the strongest growth category and the company’s attempt to give back to our ailing planet with a unique list of specifically designed fabrics including CarboCool™, S.Cafe™ and Ecosmart™. This line not only looks great on the golfer but is great for the world’s golf environment. For Spring ’13, AUR welcomes Stormpack under its umbrella. Stormpack is a continually evolving outerwear collection. Given its positioning it was a natural fit to incorporate it into the AUR family. Stormpack offers a complete range of waterproof, breathable, windproof, seam sealed and lightweight high performance and stylish tops and bottoms for men’s and women’s. The Stormpack outerwear collection is designed so that each style can be merchandised with the AUR fashion collections. CarboCool™ fabric contains a blend of Polyester and Bamboo Charcoal. The carbonized bamboo is visual on the inside of this material as a grey tint. The benefits of this fabric include Moisture Wicking and Fast Drying for comfort, as well as Anti-Odor and Added UV Protection for peace of mind. Carbonized Bamboo is environmentally responsible, and offers the same benefits that a chemical finish would without the unnecessary harm to the environment. S.Café™ uses a patented process that transforms the coffee grounds into yarn, which is then used to produce polos. Most coffee grounds end up in our landfills, which contributes to our overall solid waste management problem. Producing a garment with S.Café™ fabrics helps in easing landfill concerns. Last but not least, EcoSmart™ is a fabric made from Recycled Polyester Yarn. Recycled polyester yarn is made from plastic post-consumer based products. It is environmentally friendly by reducing fossil fuel consumption and green house gases when compared to regular polyester production. The Ecosmart story encompasses 2 different fabrics including 100% Recycled Polyester and Combed Cotton/Recycled Polyester. 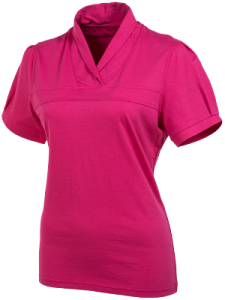 The Combed Cotton / Recycled Polyester provides the durability and performance of polyester with the added comfort and breathability of cotton. Very informative review of AUR. I like the various necklines and comfort is key on and off the course. Sounds like the women are going to styling this coming year. Great write up GG! The neck lines are very unique. Might have to look these up for the wife! Great thoughts here Morgan on some apparel for the ladies! I will admit that you had me laughing a few times while reading this. The shirt with the tapered sleeve and that crossed neckline is kinda blah. Maybe it needs a different color for the trim or something but looks like it would be a bit snug. I did not check their site but wonder about affordability….seems often these end up costing like $60 for a piece which is excessive IMO. AUR is highly underrated as it can sometimes be hard to find sometimes in the larger box stores. This is a brand I’ve looked at quite a bit in the last couple months. For some reason I just haven’t pulled the trigger. I’ll have to grab one shirt to give a test run. You crack me up by the way. Great review, GG! This is a new to me brand as well, as I dont know much about them, but sounds like you were impressed with their overall quality. Also, any review with a Tommy Boy reference is well done in my book! Tommy Boy FTW! I was showing my wife some of these pictures and she seemed to be genuinely interested in them. Possible purchase in the future could be happening! Very nice review! New brand to me, but seems like some quality stuff for the female golfer. I wont lie, the Tommy Boy reference made me chuckle. Excellent review Morgan. I LOL’d at the Tommy Boy reference. I think they make some good looking apparel. I have almost pulled the trigger on some mens stuff on a few occasions. Awesome job on the review Morgan. I force my wife to read all the reviews on the ladies stuff hoping it will get her more into wanting to play golf. I like the look and style. Women’s golf clothes have come such a long way these last 5 years. Very informative review. I like AUR golf apparel, cut and style of polo shirts are great bought for on and off the course.